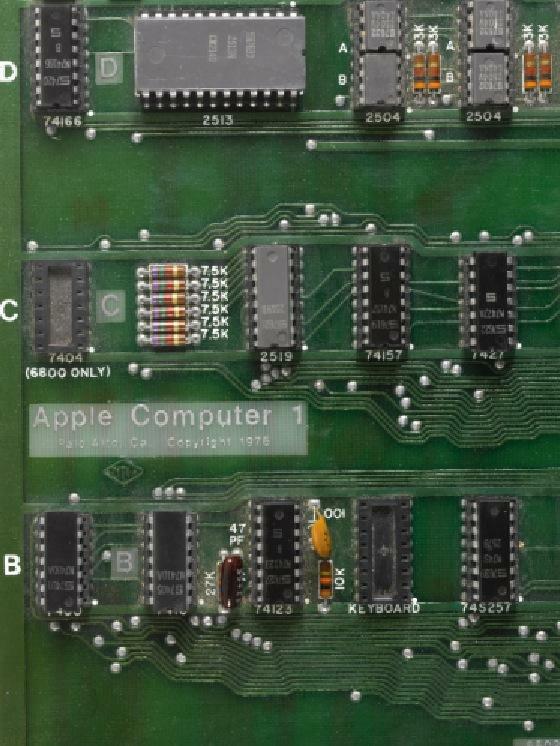 Auction house Sotheby's on Friday sold two rare pieces of Apple history in a functioning 1976 version of the company's first motherboard and an unrelated note written by Apple co-founder brought Steve Jobs from his time at Atari. Initially estimated to sell for between $120,000 to $180,000, the Apple I motherboard auction brought in $374,500 to more than double Sotheby's high-side sale price while Jobs' note managed $27,500 to beat its estimate by over $12,000. An anonymous phone bidder won the lot after a heated battle with an absentee party represented by the auctioneer. Only 200 copies of the Apple I, originally called the Apple Computer 1, were made and Sotheby's believes that Friday's lot is one of six known working models of the approximately 50 that survived. Built by co-founder Steve Wozniak, the Apple I was sold to company friends and through vendors for $666.66 in 1979 without keyboard, monitor or power supply. The lack of a case prompted a multitude of homemade enclosures crafted from wood and other interesting materials. "The Apple Computer. A truly complete microcomputer system on a single PC board." When Steve Wozniak and Steve Jobs presented the Apple I Computer to the Homebrew Computer Club in 1976, it was dismissed by everyone but Paul Terrell, the owner of a chain of stores called Byte Shop. Terrell ordered 50 computers for $500 apiece, insisting that the circuit boards come fully assembled rather than as DIY kits similar to the Altair, and Jobs and Woz managed to produce the requisite computers in 30 days. They continued production, immediately creating 50 additional Apple I's to sell to friends and an additional 100 to sell through vendors, at a retail price of $666.66, a number that garnered complaints among conservative Christians, but provided a lucrative 33% markup. Included with the motherboard was the Apple I Cassette Interface with manual, the computer's Operation Manual with eight circuit diagrams and a Preliminary Apple BASIC Users Manual with warranty information. 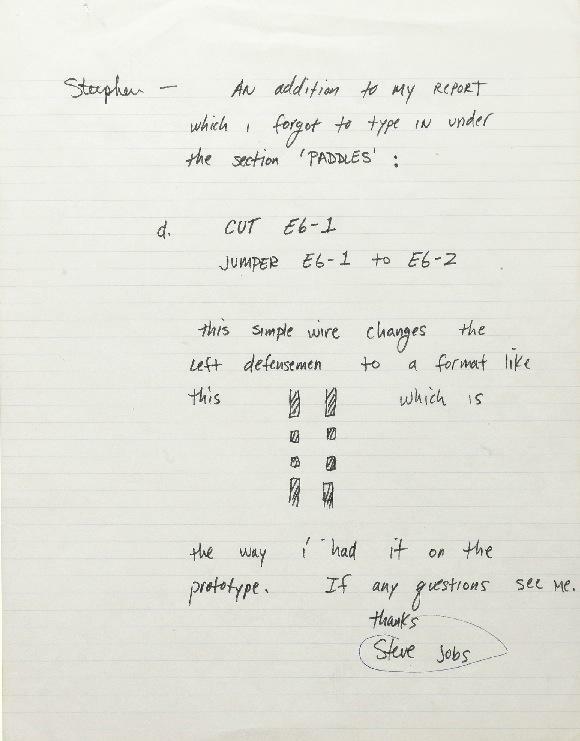 The partially-handwritten letter from a 19-year-old Steve Jobs dates back to when the tech guru worked for Atari in 1974 and is in regards to the company's World Cup soccer game. While most of the note is typed and contains technical improvement suggestions, Jobs stamped the bottom of the manuscript with the "All-One Farm Design" name in homage to the commune he frequented at the time as well as his home address and the Buddhist mantra gate gate paragate parasangate bodhi svahdi which translates to "Going, going, going on beyond, always going on beyond, always becoming Buddha."